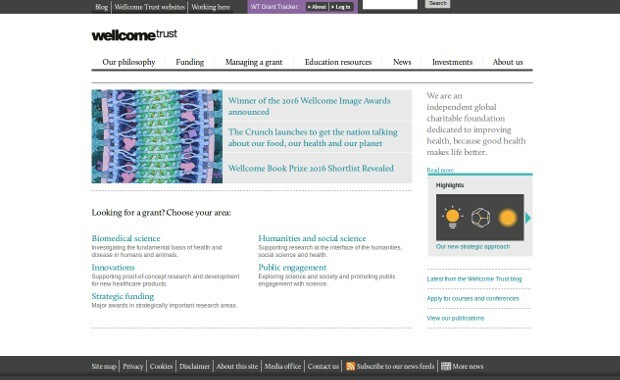 The vision of the Wellcome Trust is to achieve extraordinary improvements in human and animal health. In pursuit of this, they support the brightest minds in biomedical research and the medical humanities. They focus on three key areas of activity, reaching across five major research challenges. Their funding focuses on supporting outstanding researchers, accelerating the application of research and exploring medicine in historical and cultural contexts. They are committed to maximising the application of research to improve health by focusing on new product development and the uptake of patient-oriented research advances into clinical practice. They also strive to embed biomedical science in the historical and cultural landscape, so that it is valued and there is mutual trust between researchers and the wider public. Finally, they work with researchers and the creative industries to help societies to explore and become involved with biomedical science, its future directions, its impacts on society and the ethical questions that it brings. Alongside support for dialogue and informed debate, they seek to spread the delight and interest many derive from science and its intrinsic spirit of curiosity. The Wellcome Collection enables the public to explore the connections between medicine, life and art. The venue offers visitors contemporary and historic exhibitions and collections, lively public events and debates, and is host to the world-renowned Wellcome Library.